Over the last year I have journeyed with a dear friend as she watched her mother’s health fail. Initially there was hope that the situation was a temporary setback. A few months revealed that was not the case. This particular friend is an extremely busy person who gives back to her employer, family, friends, and community. I made myself available, and when she had free time we labored together as we watched each of our mothers decline. Things spelled downhill rapidly and her mother passed away recently. The funeral was out-of-state so I sent flowers and checked on her each day. Imagine my surprise when she drove by my home once then twice without even stopping or offering more than a slight wave after she returned home. Had I done something? Said something? She sent a few brief texts saying she was not up to talking yet. It’s perfectly fine for my friend to have this response. I respected how she handled her emotions. I deeply value my friends who are honest with me, even when it isn’t what I want to hear. Sometimes we put an unattainable and unnecessary goal on others to respond to their grief in the same we would and in the same time frame. It is impossible to know what is going on in another person’s thoughts. More than that, are you prepared to hear it if they pour out the details to you? I have another friend who regularly apologizes for saying she is brutally honest. In reality she is one of my most trusted friends. Do you value the friend who tells you when you have food sticking between your two front teeth. The friend who doesn’t deliberately post the worst photo of you on Facebook simply because it is the best picture of her or him? The friend who tells you when you need to work on your attitude or outlook? My closest friends protect my trusted information. They challenge me consider my options, use the wisdom of others, to pray more, be a kinder person to both the lovable and the not so lovable, to give more generously. To be less like myself and more like Jesus. I’m a work in progress with a long way to go. I need friends who look me in the face and speak the truth in loving words. Most of all I cherish the friends who love me enough to listen when I want to talk, pray when I’m silent, and share their burdens with me also. What are some of the most important qualities in your friendships? 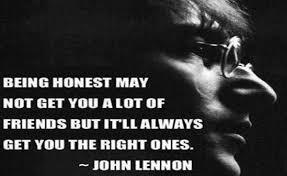 I agree that the best friends are those that are honest — and also those who I can be honest WITH. It is not a real friendship if either person has to walk around on eggshells, afraid to speak the truth. Kudos to you for recognizing that feedback from a friend is a good thing and for being willing to listen to it. You put that so well! Yes, a real friendship involves truth and trust from both parties. This is an important quality to me as well. I find myself using the benchmark ‘If they will talk to you about someone else, they are talking to someone else about you’. This can obviously be a generalization but I have found it to be a good tool – both positively and negatively – for many relationships. It can affect my trust temporarily in other relationships if my confidences have been betrayed by a friend. I am a work in progress! Thank you so much! I appreciate the kind words.